As I mentioned a little while ago, I am a big fan of Kevin Hearne's Iron Druid Chronicles. I'm pleased to report that Hammered is another fun installment in Atticus' adventures. Hammered is all about Atticus paying his debts. He made two promises in Hexed: that he'd steal a golden apple from a Norse goddess, Idunn, and that he'd help his vampire friend Leif kill Thor, conveniently another god from the Norse pantheon. Killing Thor is a big, big deal and isn't actually something Atticus wants to do, but he's made the deal and he's a man of his word. Thankfully, at least from his perspective, Leif isn't the only one with the big hate for Thor, who is almost universally disliked. He gets called some truly awesome names, which I hesitate to repeat here since a few of them are quite off colour. Suffice to say, everyone thinks he's a jerk and a lot of folks want to kill him. Atticus, of course, realizes that killing a major god is going to bring him a lot of unwanted attention and it's not hard as it used to be to find the last living Druid, so a significant part of the novel involves him making plans for a move, assuming that he and his merry bunch are successful on their mission. I liked this for a couple reasons. First, it means we get to spend time with all of the secondary characters. Second, it seems like the sensible thing to do and you'd assume that someone who's been alive for over 2,000 years knows a little something about getting ready to go to ground. Third, and perhaps most important to me, it shows you that Kevin Hearne isn't afraid of big moves, which is one of my favourite qualities in an author. I admire and adore authors who make Big Changes throughout their stories and who are willing to mess with the status quo in the hopes of creating a more thrilling story. The events set in motion from the start of the novel let you know that you're going to get something pretty exciting in future novels. One of my other favourite things about Kevin Hearne is his prose. He gives the reader fantastic quips and chapters that start out with fantastic hooks. 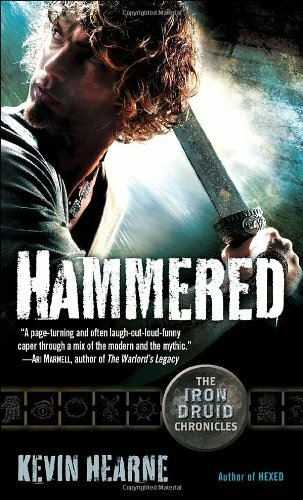 The first paragraph of Hammered is particularly awesome, so awesome that I'm going to link to it here. (The link is actually to a bunch of sample chapters from the book, if you want to get a feel for it.) I also really liked the introduction of Norse mythology to the series. Most of my knowledge on the topic comes from high school and the movieThor, which is admittedly not the best frame of reference, so it was a lot of fun to delve into this world. Kevin Hearne does a great job of immersing you in the myths and ideas without overwhelming you, and without making you feel like you're reading a textbook. All of the information gets fed to readers in an organic manner and it's a real treat. It's also fun to see the gods and goddesses personified in such a playful way. I can't say too much about Atticus' adventures or battles without giving away some big hints about the plot so all I'll say is that there are again great action sequences and interesting new characters, and an ending that makes me desperate to know what happens next. This is particularly painful since the first three books have come out about a month apart, and now we have to wait until April 2012 for the fourth book in the series, Tricked. I'm sure it'll be worth the wait, though, if the first three books in the Iron Druid Chronicles are anything to go by. I have Hounded on my TBR shelf...I just need more time.:). I know what you mean. :) I bumped these books to the top of my TBR pile because I loved Hounded so much. Hopefully you'll enjoy it too, when you get around to it.